When the ladies from this year’s Colourful Journey came to visit us, we gave them a polymer clay lesson and sold them some jewellery. We will write more about their visit later. One of the things that made us so happy was that we raised enough money from selling our jewellery to buy a spice grinding machine. We told the travellers that we were so happy because we had nearly made enough. They all asked how much more we needed and decided they would do MORE shopping to make sure we had enough. Ganga runs our small shop which is called Kirana Pasal. There are many, many Kirana Pasal and they all sell the same things. It means that not many people come to our shop and it is hard to make a living. We knew that we had to offer something different so had an idea to sell ground spices. We were taking our spices to a man in Birtamod and he charged us money and told us that women could not use the grinding machine. 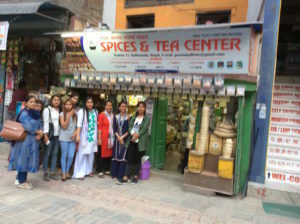 When Wendy Didi and I were in Kathmandu last month, we visited her favourite Spice Shop in Tahity Tol and the lady there was too helpful and showed me her machine and told us how to use it and said we could come and visit and learn. I was so excited and wanted to come back with Ganga as soon as I could. We were all so excited to see the machine and how easy it is to use. We can buy it in Kathmandu and have got costings. We will even have enough rupees left over to make a sign and labels for our bags of spices. One of the travellers on the trip had the good idea to make some sweets and we think we can call our shop Sweet and Spicy! It means our shop has something different to offer and we hope that this will bring more business.